Awesome Con is Washington DC's comic con! We celebrate all aspects of Geek Culture, including comic books, sci-fi, fantasy, horror, anime, gaming, TV, movies, animation, music, comedy, art, science, and more! You can get all the information about Awesome Con at awesomecon.com, and follow us on Facebook, Instagram and Twitter. Club Awesome is the coolest way to experience Awesome Con. 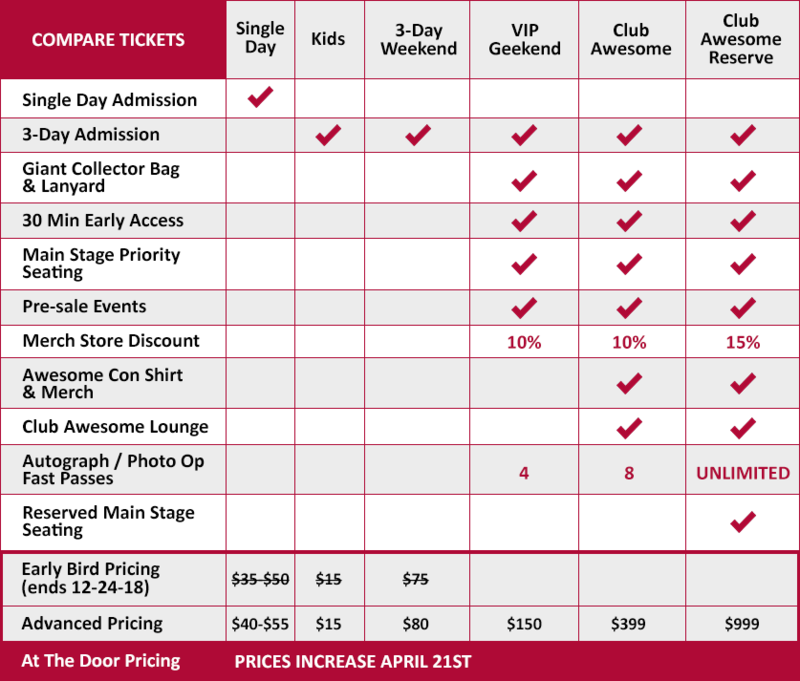 Membership in Club Awesome includes access to the exclusive Club Awesome Lounge, the first seating group for the Main Stage, and more! See all our Club Awesome details here! Make sure to read up on all the benefits before you purchase. A weekend or single day ticket gets you into 99% of everything that’s awesome at Awesome Con, but if you want to get in early and get your hands on some sweet swag, you’ve got to go VIP! Any pass purchased by March 12 can be mailed to the address you provided. BADGES WILL NOT BE MAILED IMMEDIATELY AFTER YOUR ORDER. Badges will be mailed to US addresses only, with all international orders held for pick up. Special Event tickets and merchandise orders will also all be held for pick up at Awesome Con. Merchandise will not be mailed and must be picked up at Awesome Con. All attendees three-years-old and up need a ticket to Awesome Con. We recommend all children under 18 attend with an adult, and all children under 13 must have an adult with them while attending Awesome Con. Guest-specific VIPs (the “Dave Bautista VIP,” for instance) provide guaranteed, pre-paid autographs and photo ops, plus admission to the con - all in one bundle - plus a few extra perks like swag. Autograph sales, photo op sales, and the programming schedule will be release about 3-4 weeks before Awesome Con 2019.